In this Friday, May 19, 2017 file photo, students line up for lunch at a middle school in Sandy, Utah. 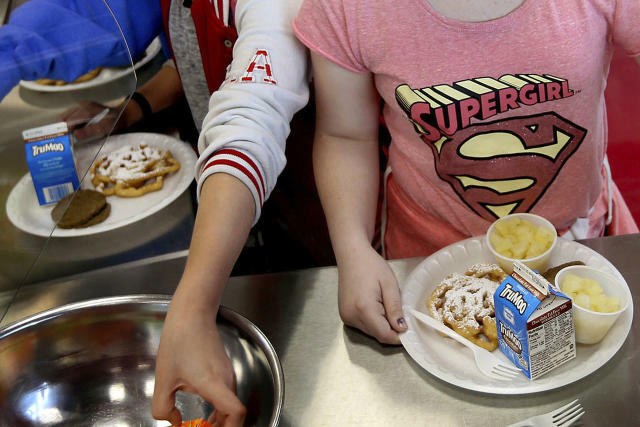 New York has joined five other states and the District of Columbia that have sued the Department of Agriculture, accusing the federal agency of weakening nutritional standards in school meals. The lawsuit was filed on Wednesday, April 3, 2019 in Manhattan federal court. You got to love the Republicans. They go to the mat to protect the unborn but once you’re born it’s “just go away”. They won’t help kids in lower grades get one decent meal per day. They degrade public education in favor of the profits of Charter Schools. They back the NRA so that “active shooter drills” are as common as the Fire Drills we used to have. They cut back on College Financial assistance ensuring that most graduates end up thousands of dollars in debt. They oppose raising the minimum wage which keeps most of these indebted graduates living at home working for peanuts. Yes, it’s “just go away” but the Republicans aren’t totally neglectful. Stick around, once you reach 18 they might need you to fight a meaningless war in some foreign land to protect their hold on oil, tin, lithium, or whatever they crave.